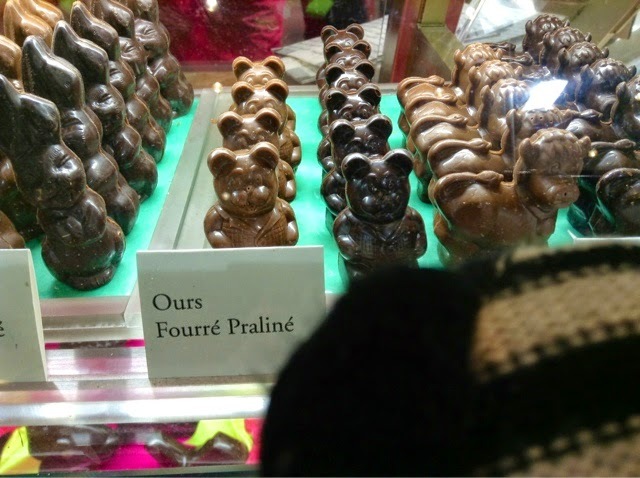 A PBer emailed me suggesting Bear should get out to see Easter and Spring in Paris. Friday was overcast, rainy and gloomy but some green buds are showing up on the trees. Hooray! 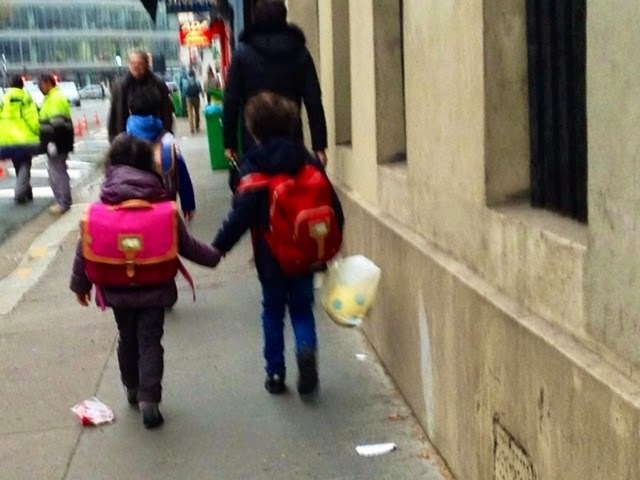 We followed the kids walking to school in the morning. 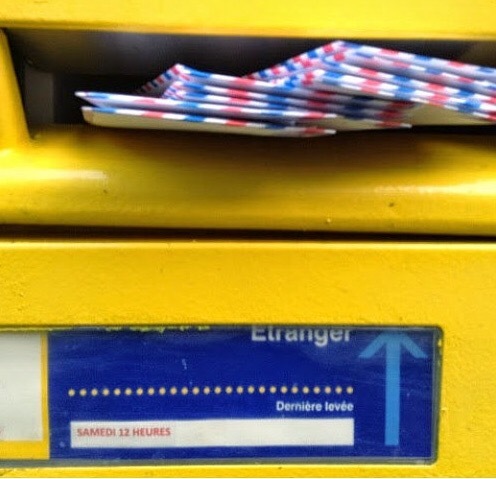 On our way to La Poste. 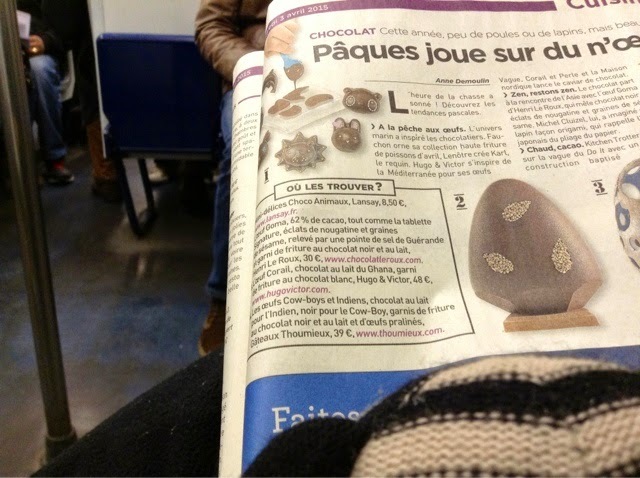 Then into the Metro to read important news. 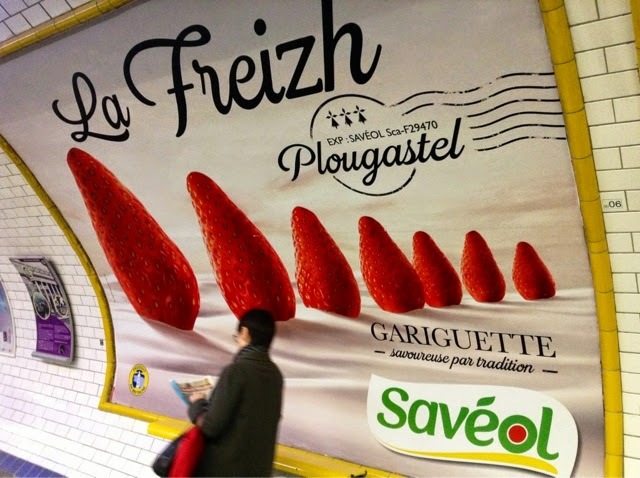 Are there gigantic strawberry posters in your subway/underground? 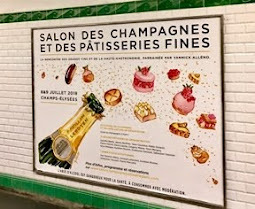 This is strictly a French phenomenon. It's taken me 2 years to realize the berries are not in the snow but WHIPPED CREME! Getting acclimated is not so easy. 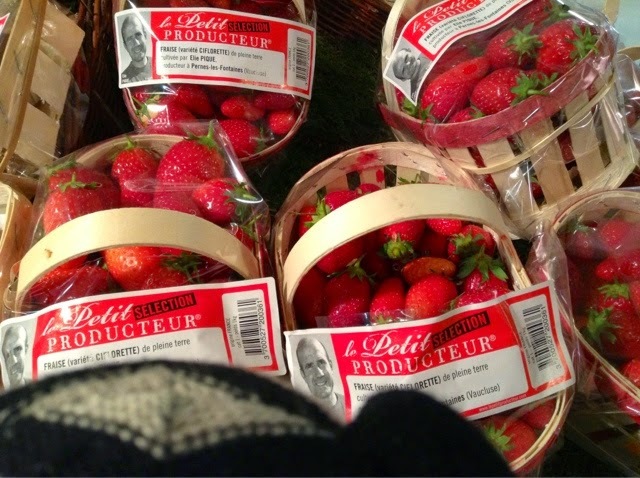 Bear thinks we should grab the first strawberries coming into the market. Too soon mon amis. Bear is having a pink moment. Or else he's excited because he's going to AMSTERDAM next week! All suggestions are welcome PBers. More pink. I say no way Jose. I have already sampled too much Easter candy. 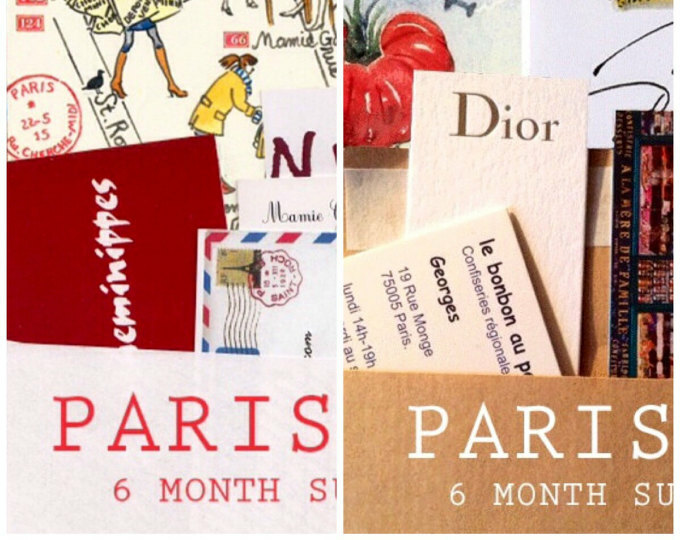 The Making of the Paris April letter - inspiration comes from every window. 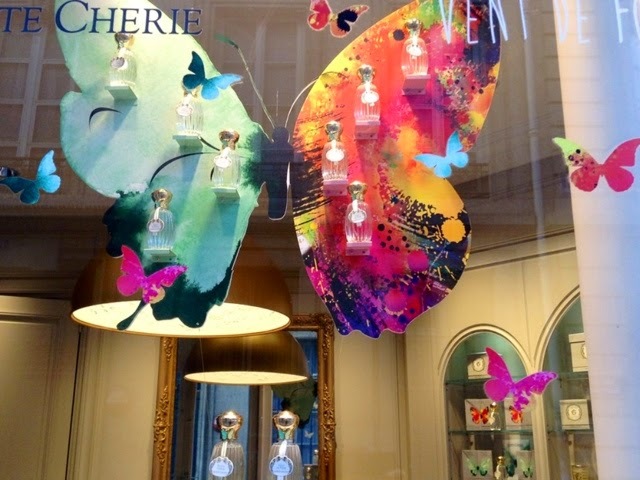 Papillon from perfumer Annick Goutal. 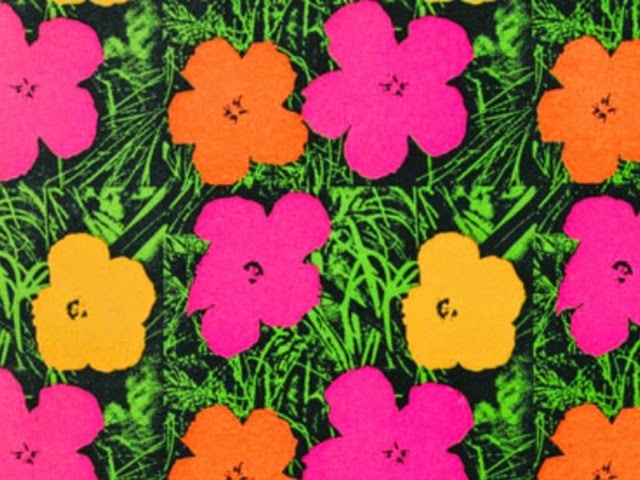 Bear suggests Andy Warhol's big Springy flowers. I 'borrow' just the grass. 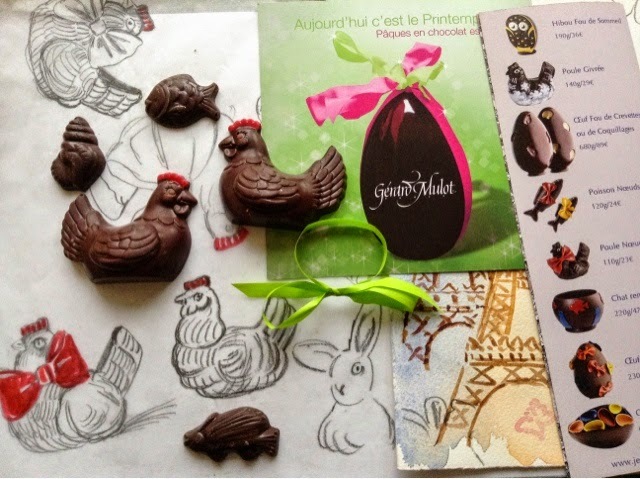 The April Paris Sketch letter is personalized with your name on it and comes with very nice chocolate brochures. I always enjoy your posts, Carol. Happy Easter weekend and have a great time in Amsterdam. 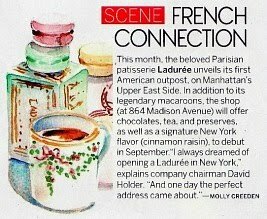 Was there about 15 years ago and had the most wonderful pancakes in the smallest pancake house. There were adorable teapots dangling from the ceiling. Loved it. Looking forward to your dutch posts. Yes! I read abt it. I should tell you..even if it's evident..that I always love your posts too. Have fun in Amsterdam..I used to love dropjes and my Dutch friend Gwendolyn Brejaart used to bring some back for me from Holland. Like a salty licorice..And I loved the windmill cookies..speculaas. Do you think the tulips will be out? Love all your aquarells..and seeing the Littles walking hand in hand.. I kind of like that aquarelle jacket.. I wouldn't wear it but I like looking at it. We are going to the tulips 1st day after lunch of course. I didn't even notice the aquarelle jacket...sharp eyes M! I thought it was snow, too! But of course cream makes much more sense. I bet Bear knew it all along. 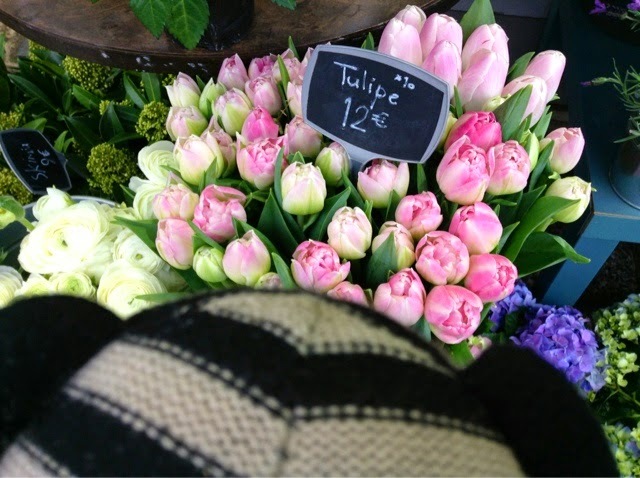 The flower market & the van Gogh Museum! The popular museums at the museumplein are very popular. The Van Gogh can have wating times up to 2 hours, just to get in. The Rijksmuseum can be too full as well, especially with a temporaray display of all the late Rembands at this moment. The Stedelijk museum for modern art has a special on Matisse. This time of year it's extra busy. I received your Easter water color. It's very beautiful! Should I ever have the opportunity to go there, will be interested in seeing what you find to be some of the high points of Amsterdam. Looks like a lovely week coming up in Paris, weather-wise, so perhaps you will find the same in Amsterdam for touring. 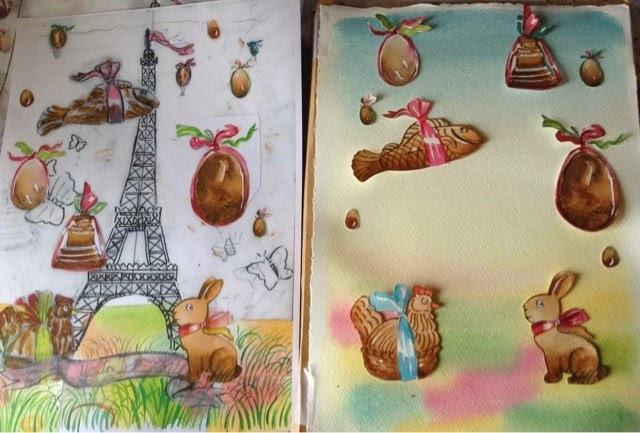 Hope you've had a lovely Easter in Paris. Happy Easter, Carol, and have a wonderful time in Amsterdam. I look forward to your report of all that you & Bear experience, especially the tulips. Enjoy. I've been many times. I like a little canal side cafe frequented by locals called The Baton on the herengracht canal at herenstraat on the corner. Can't miss it. Looks like 2 days will not be enough time but I'll be back. Fantastic! 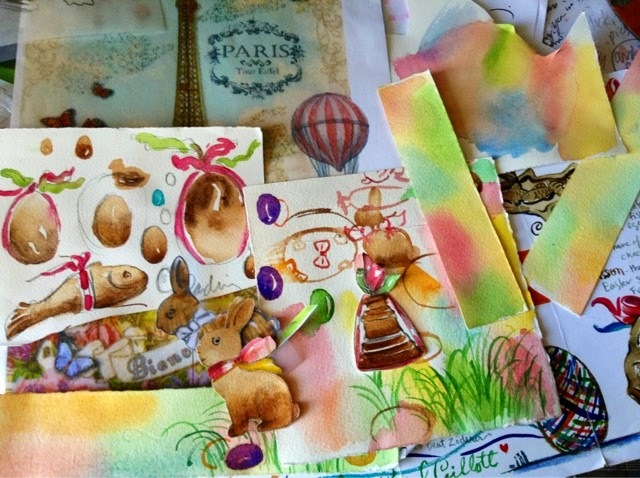 Have a beautiful Easter in Paris! And a wonderful trip! Even rainy/overcast - Paris - tres belle! Happy Easter from Mile High! Beautiful as always, Carol! 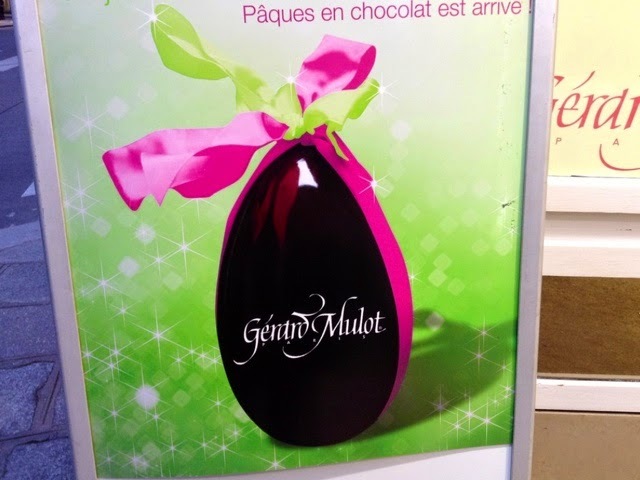 And I've had Gerard Mulot on my list for weeks, getting ready for my April Paris trip. Can't wait! 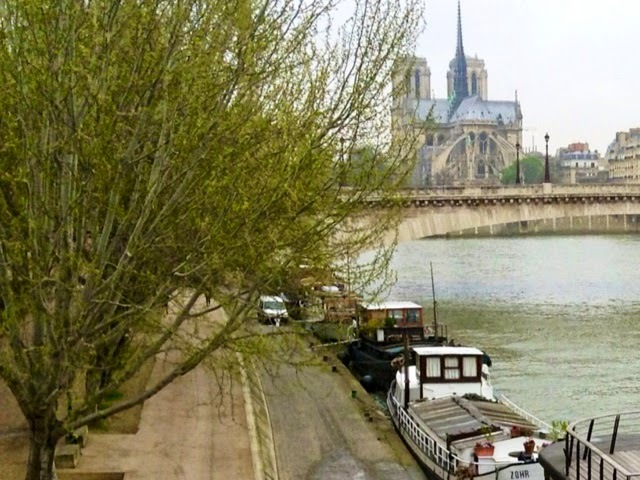 Happy Easter and thank you for the wonderful views of Notre Dame and "your" island. We are having a dampish cold Easter morning. And thank you for all things Parisian, it always gives me such a lift. 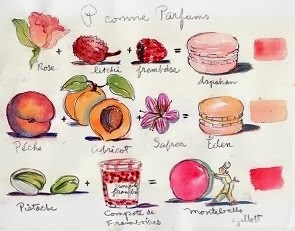 Sweet, sweet, sweet...you make me want to be in Paris today, foul weather not withstanding. 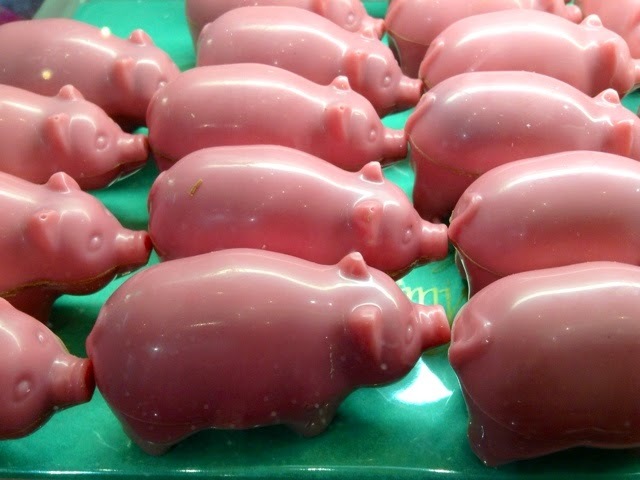 Joyeuse Pacques. The Begijnhof (Beguinage) is a tranquil courtyard in the center of the city. It dates back to the fourteenth century, when it was built for the Beguines. The oldest and most famous of the many courtyards in the city, the Beguinage was created in 1346 to house Beguines, pious Catholic women who lived and dressed like nuns, without taking formal vows. They lived together in small urban communes known as Beguinages. Love yr animal drawings too. Amsterdam: Loved the boat ride at night through the canals, it gave an overall view of the city...Better than in Paris even because it covered more territory...Loved the train from Paris to Amsterdam. LOVED the Van Gogh Museum & Rembrant's house & studio. & the flower market...Loved Kuekenhof to see the tulip fields, amazing if they're in bloom..& the architecture of the houses along the canals...Regret not having gone to Anne Frank's house....The Rijksmuseum was closed then, open now, love the mall in front of it with the giant letters...Loved walking around. 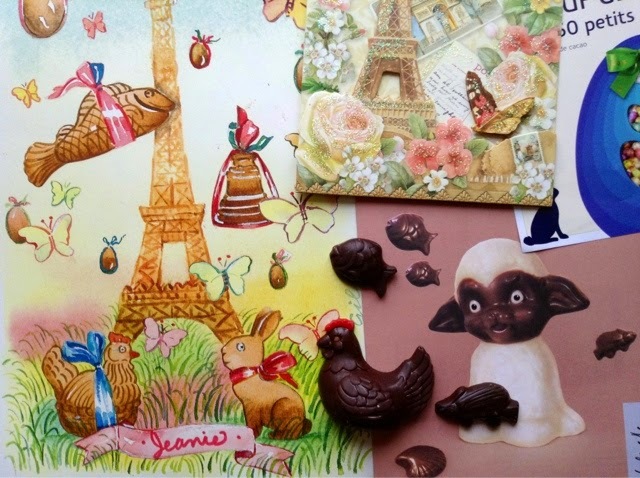 Love your Easter portraits though cannot look at le chocolat too long, o dear. 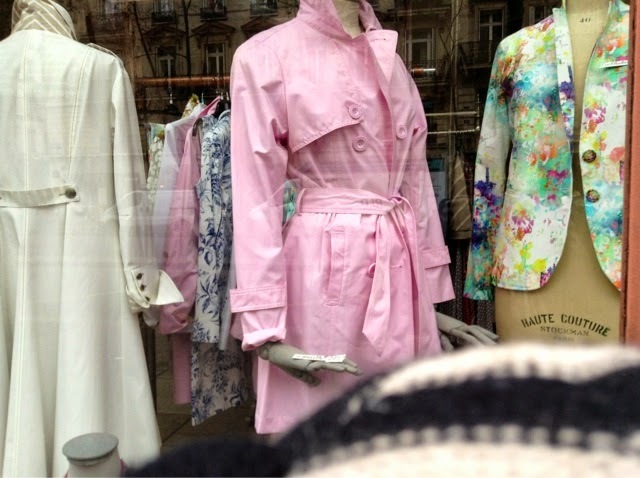 Love your views of Paris & a glimpse of your daily life. Re. yr note: So, you're on to my resistance to throw off my clothes to dive into the sea, or to dive into the sea with all my clothes!! Heck, I'm even resistance to swimming in the cold waves WITH my bathing suit these days even tho' in my youth I swam from May to Oct, here cold Maine seas! LOVE all yr great suggestions! Happy Easter! 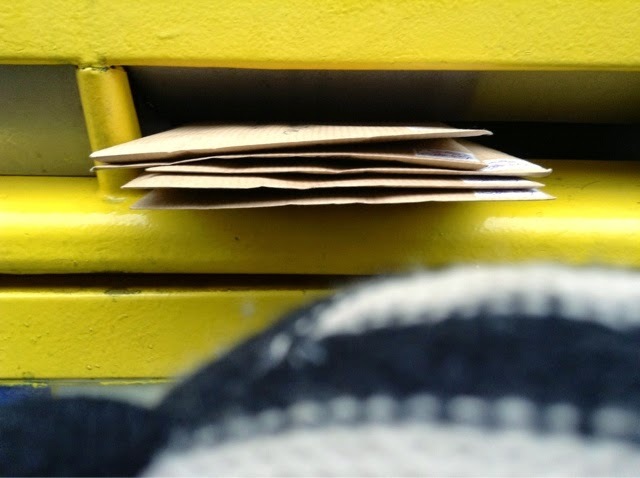 Lovely post, as always! Tres wonderful to see Bear --!! Lots to like in this post! 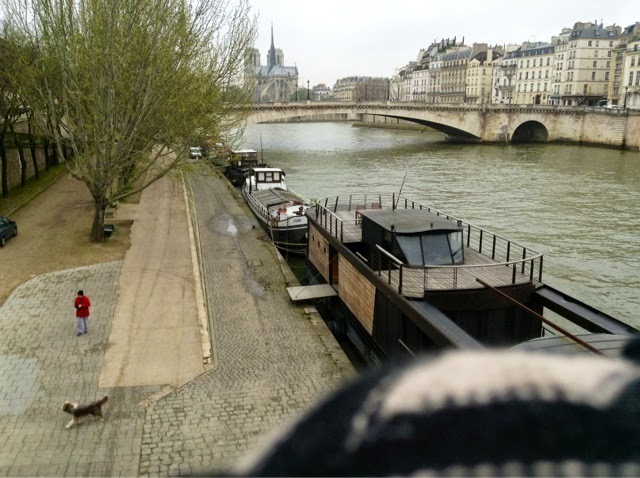 The river & the barges, Bear, The budding trees, the Metro, chocolates, kids, and your beautiful photos! 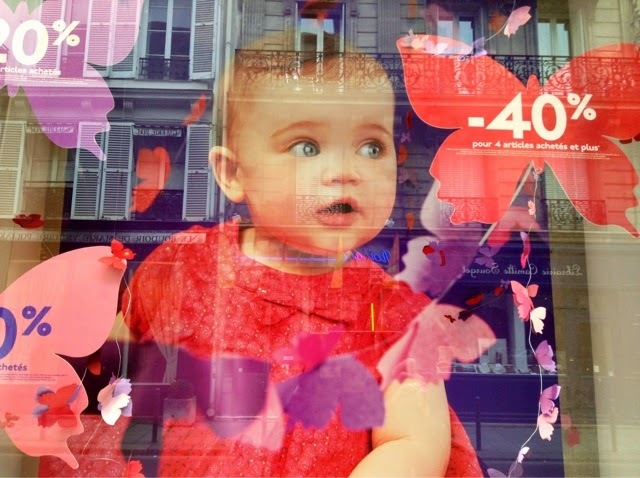 I really like the shop window photo - the colorful pic of the wide eyed kid staring out through all of the reflections and percentage-off cut outs - beautiful! Bear DOES travel to nice places! And I think I spy my letter! Unless you have two Jeanie subscribers! Oh, the anticipation! Best meal was at a small, fairly new little place called Ree 7,located at 7 Reestraat. Relaxed atmosphere, very charming, delicious. Both of the above located in the Nine Streets area – wonderful small shops in a beautiful part of Amsterdam. My cousin told me that winter was mild, so there may even be some early tulips. Be sure to go to the Begijnhof. It's a bit of medieval Amsterdam in the heart of the city, just off the Kalverstraat (calf street), Amsterdam's pedestrian only shopping street that runs from Dam Square to Rembrandt Plein. If the weather is sunny, it's nice to have a drink or a bite to eat at one of the many cafes that circle the square and soak up the sun. Do take a canal cruise. The guides all speak English. It's a wonderful way to see the city, even if it's raining. We always do one in the day time and one at night. Many of the bridges and buildings are lit up at night. You can book tours at the harbor in front of the Centraal Station, or near the American Hotel at the Leidseplein, Amsterdam's nightlife center. Do stop to look at the bar. Very Art Deco. Amsterdam is not beautiful like Paris, but it is gezellig (make the g as guttural as possible), which is a Dutch word that means cozy and fun and friendly - it's one of those words that has multiple meanings and applications. If you're in a cafe or pub that you like, tell the wait person that you think it's gezellig, he/she will be very pleased. And if something tastes good, the word is lekker. But most people you will meet speak English and French. When Dutch is your native tongue, you've got to learn other languages, cuz no one wants to learn Dutch. Do wander along the canals and the Amstel River if the weather is mild. The area around Rembrandt's house is interesting, particularly around the University of Amsterdam. If you have the time and the tulips are blooming, take a trip to Keukenhof. This is a garden showcase for the bulb growers located on an old estate outside Amsterdam. Breathtaking! You can get a bus from Amsterdam, but we took the train to Leiden, the old university town and quite charming, and took the bus from the train station square to the gardens. Last year we spent the whole day at the gardens. On the way back to Leiden, I talked with a nun from Belgium who makes the trip annually. She was from Antwerp, so we spoke Dutch. Have dinner in Leiden. It's known for its pancakes. You'd be amazed at all the toppings. I was. At home I make Dutch pancakes, a little thicker than crepes, for breakfast and dinner with Gouda and sometimes bacon. Savory yumminess. My visit to Amsterdam was so long ago ... The summer the Van Gogh Museum opened! Loved it so. Anne Frank's House so memorable still ... And the trees along the canals were stunning! Oops ... Enjoy your stay! ...and i too cannot wait for Shaun the Sheep ! I've only recently discovered this by way of babysitting my grandchild. I always love reading about Bear's adventures. Can't wait to see what he gets up to in Amsterdam!